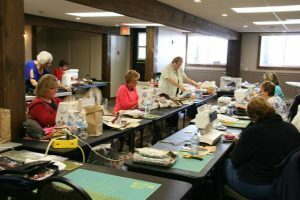 Book your group of up to 25 talented quilters and enjoy exclusive use of our large sewing room. The tables are set up ready for your machines where you can share and learn from each other while creating beautiful quilts. Delicious meals are served in our lakeside restaurant and comfortable rooms are all located in the Main Lodge. Contact us to learn more.